Add a bit of Zen to your home with the Buddha Deco Set. 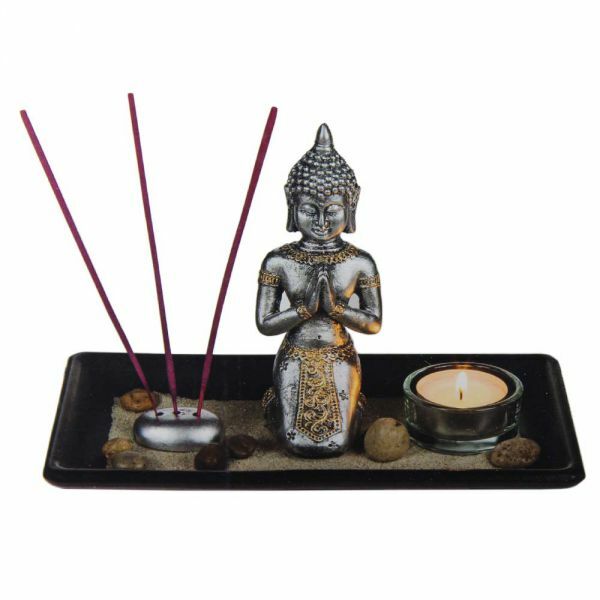 Specially designed to help you unwind and relax, deepen spirituality and to heal, the Buddha Deco set is a great addition to any home. The Buddha Deco Set is available now for £14.99 and makes a great gift. For extra incense sticks check out our Nag Champa, which is perfect for mediation and provides an elevated mood. Even the most serious of smokers will probably agree that coming into a room the morning after a very pleasurable smoking session the night before can be not the most pleasant of experiences. There is a tried and tested method of removing the smalls in minutes using an environmentally safe spray, the Re-Fresh Odor Eliminator! This non aerosol spray is equally effective against other unpleasant smells, in the home, office or car, such as cooking, rubbish and pet smells and will keep the room or car smelling clean and fresh for hours. The Re-Fresh Odor Eliminator is very cost effective too; each 4 fluid oz. (118ml) can of spray, will give up to 750 mist sprays and the range of scents is wonderful. With a choice of Cranberry, Tropical, Green Apple, Spring Rain, Natural Citrus Melon Magic and Pomegranate Punch to choose from, the car or room will smell clean and fresh in minutes. Re-Fresh uses the clean, natural power of citrus oils to destroy tobacco odours, we must stress that although you may think that you would smell just as sweet if you used it instead of your normal deodorant, Re-Fresh Smoke Odor Eliminator should NEVER, EVER be used on the body! We are currently offering the Re-Fresh Odor Eliminator at 20% off the list price, a perfect chance to buy two or three different natural scents, for just £7.99 each can. Now we all like to have a nice relaxing and peaceful smoke, at home or in our car but, often this can mean that the room or our cars’ will smell of old stale smoke. We find that even the most ardent smokers amongst us do not like the stale smell, but how do we get rid of it? Opening windows when we are smoking can help, but it is not always convenient to do this and even so the odour can still be detected. 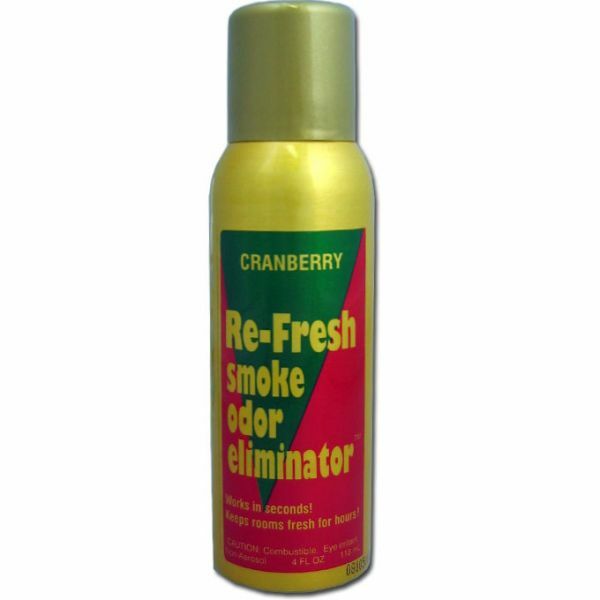 The answer to this is to use Re-Fresh Smoke Odor Eliminator, which comes in a variety of flavours that include Cranberry, Tropical, Green Apple, Spring Rain, Natural Citrus, Melon Magic, Pomegranate Punch, or Crisp Cotton. It is not just stale smoke that Re-Fresh will banish, it will work equally well on every day smells, it works on eliminating cooking, pet and other household odours. Unlike other air purifiers and air fresheners, you will soon discover that the Refresh Smoke Odor Eliminator is strong and highly effective. We are offering this at the moment with a 20% discount, so with hundreds of sprays from the 118ml can, you will find that it is very cost effective. No need to put up with stale smoke and other offensive airborne odours, gone for just less than a few pence per spray and it is environmentally safe too. The fictional planet Gallifrey in the TV series Doctor Who, is the original home world of the Doctor, The Master, and The Rani, as well as other Time Lords that have been seen on the show from time to time. It is the Galifrey Incense Tower that we consider is timeless and is perfect for your incense cones or sticks, what is more it will protect your furniture when burning your favourite incense. The tower will hold up to four incense sticks at any one time, or can be used to burn cone incense, whichever type you prefer. The Galifrey Incense burner is simple to use, just move the tower from the base and place the incense of your choice inside. Once you have lit the incense, place the tower back onto the base, sit back and enjoy the incense fragrance as it drifts through the neatly carved holes, truly delightful. 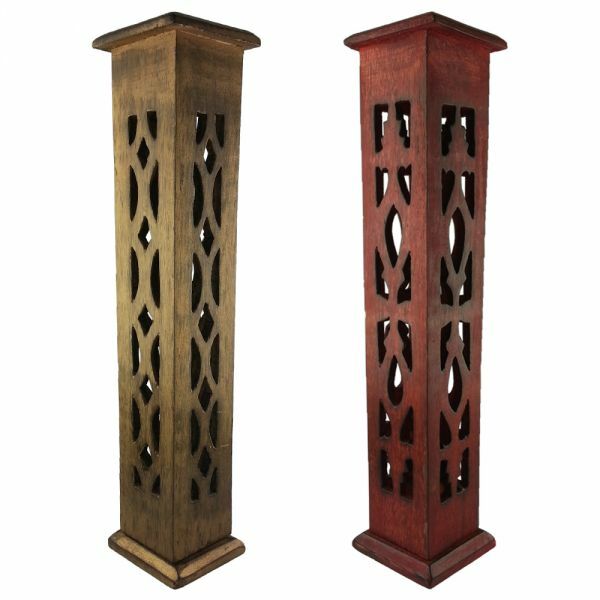 We offer the tower in either burnished gold or red and the decorative polished wood of the tower with its delicate cut-outs and elegant carvings, measuring 30cm high and 8cm in diameter can be a beautiful addition to any home; you will love the elegant workmanship and of course the fragrance produced.